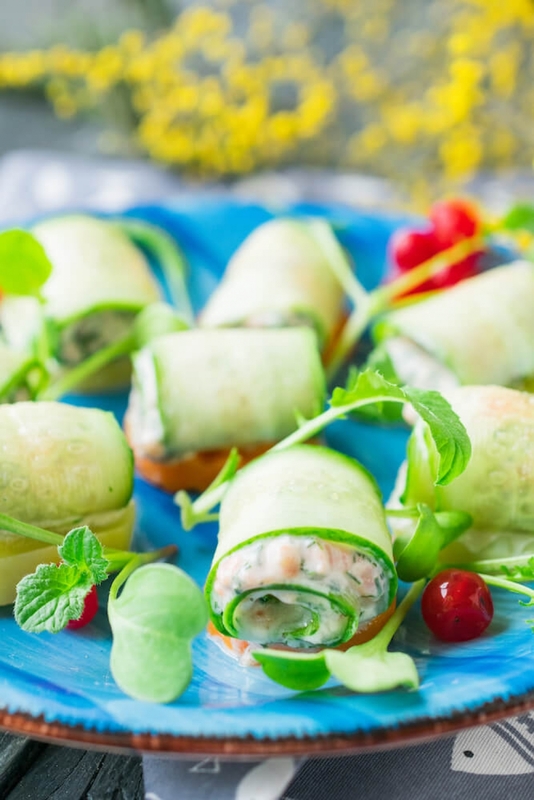 Tasty low-calorie rolls from fresh cucumber with a smoked salmon stuffing are perfectly suitable for a light snack or a holiday buffet reception. 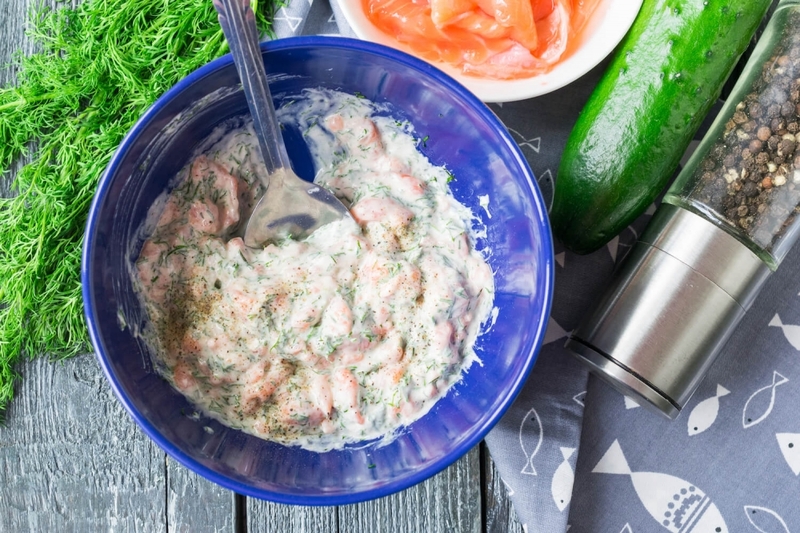 To make a snack according to this recipe isn’t difficult. We’ll need minimum of ingredients and a little free time. The result will pleasantly surprise you. Snack turns out very juicy, tasty and refreshing. 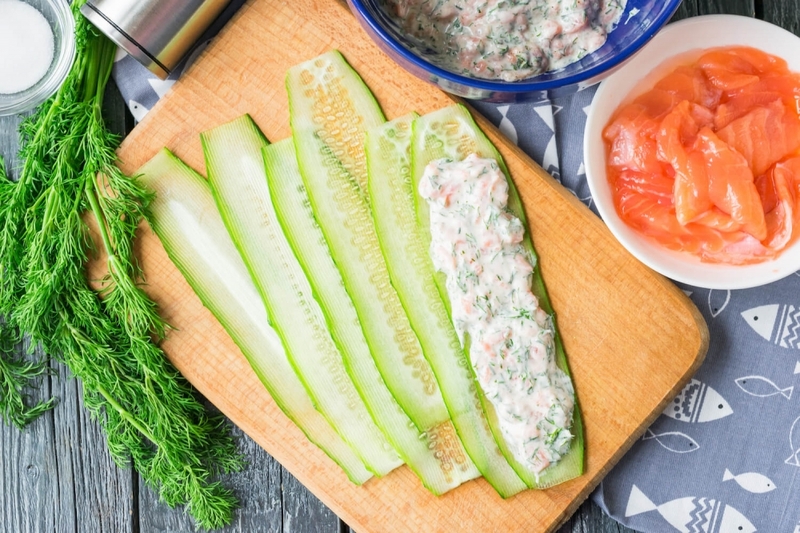 For convenience I recommend to string snack rolls on skewers or to serve them on slices of fresh bread, slices of hard cheese or pieces of boiled vegetables. 1. If necessary remove skin and pull out bones from red fish fillet. Let's cut a light-salted salmon on small pieces. 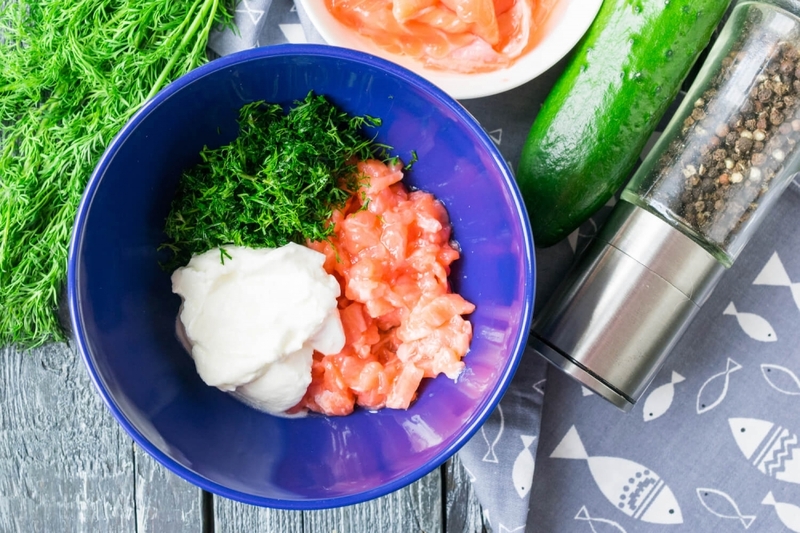 In a deep bowl combine the cut red fish, small chopped greenery of dill and natural yogurt. Add to taste black ground pepper and salt if it is necessary. 2. Let's mix ingredients to homogeneous consistence. 3. Wash a fresh cucumber and cut off tails. By means of the peeler cut a cucumber into thin long slices. Let's dry vegetables from excess juice with paper tissues so that it is convenient to form rolls from cucumber. 4. 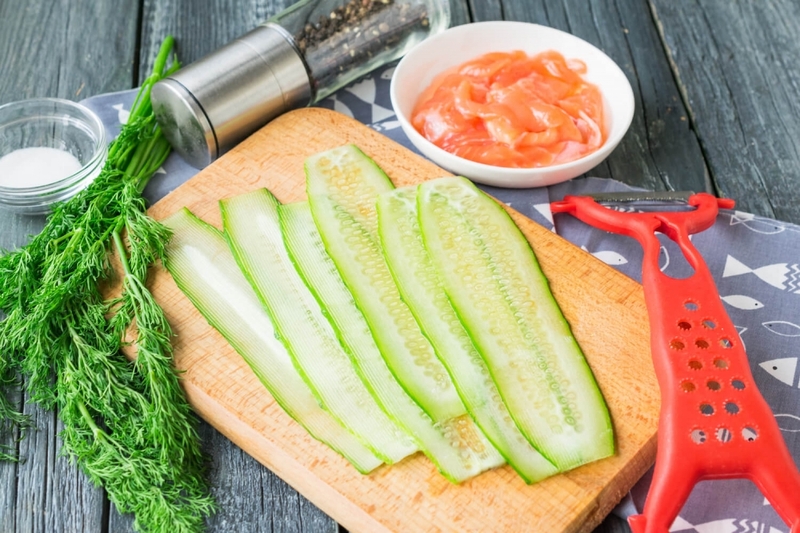 On each cucumber slice lay out a fish stuffing, leaving several centimeters from edge free. 5. Let's accurately roll a cucumber snack so that the stuffing is inside. In such way form all rolls. 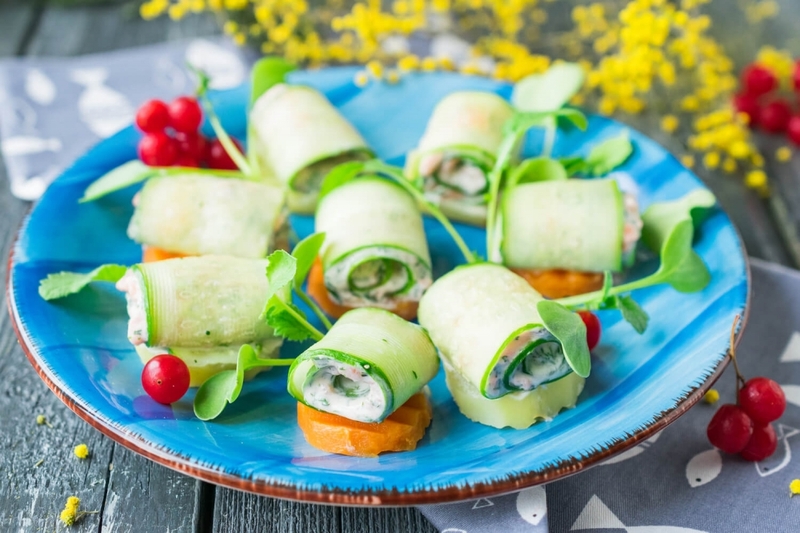 For serving red fish cucumber rolls can be laid out on thin slices of fresh baguette or circles of boiled vegetables, for example, potato or carrots. 6. 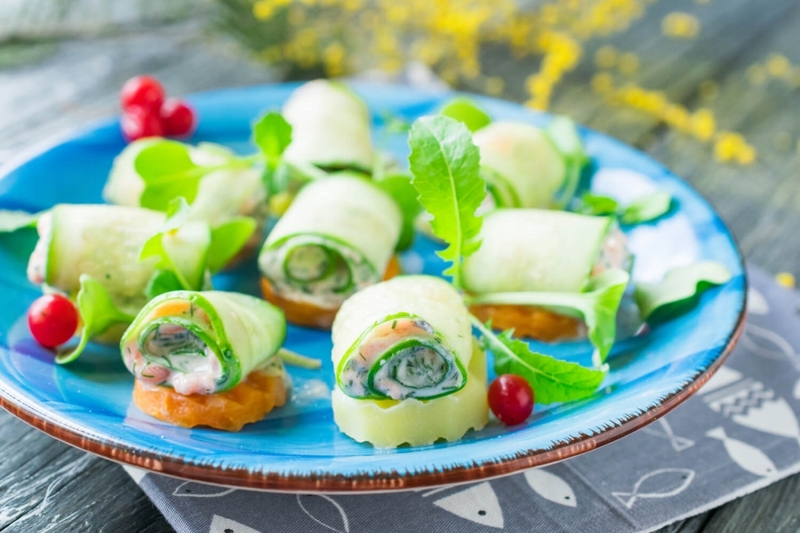 Let’s serve light salted salmon and cucumber snack rolls right after preparation as light meal.